On March 1, speaking before the U.S. Chamber of Commerce, President Obama cited this mass firing as a model of how to hold schools and teachers ”accountable.” The local school board was actually following one of four “turn around” models the Obama administration has put forward for districts to get a share of the $3.5 billion School Improvement Grant. The idea of wholesale firings of teachers is the logical product of the ”education reform” agenda which came to the fore with George W. Bush’s No Child Left Behind (NCLB) law and is now going into overdrive under the Obama Administration. The advocates of ”reform” focus on ”bad schools” and “bad teachers” as the root causes of why children from poor communities don’t achieve their potential, as well as the persistent racial gap in student performance. This is a classic attempt to misdirect the understandable anger of millions of working class parents and students at the state of their local public schools. Of course all kids deserve a great education in a safe environment with motivated teachers. And there is no doubt that, as has been documented by writers like Jonathan Kozol, the quality of education received by public school students in poor inner city communities, especially poor Black and Latino communities, is vastly lower than that received by upper middle class public school students in the suburbs. As Kozol demonstrates, a key reason for this is that public schools are primarily funded by local property taxes and this leads to a massive disparity in the resources put into schools depending on the affluence of the community. But the state of education is symptomatic of the underlying problems in society, not the cause of it. What is the reason for the massive increase in inequality in American society over the past 30 years? Or the millions of jobs lost and millions of home foreclosures during the current economic crisis? Unemployment is hitting young people particularly hard at the same time that rapidly rising tuition in state college systems is putting college beyond the reach of many working class youth. Then there is the rapidly rising number of homeless children and children living in shelters. These are the factors that are really destroying the future opportunities of young people. What ails American society and its schools is the diseased system of capitalism, not teachers, who in truth are overwhelmingly hard working and dedicated to helping children succeed. To come back to the case of Central Falls High School, there is no doubt that it was performing poorly in various ways. However, it is worth noting that none other than the Rhode Island Education Commissioner had actually cited the school for improvement in reading and writing in a 2009 report. But even within the twisted logic of “accountability,” does anyone believe that all 93 staff members were “failing”? Not the community, which has rallied around the teachers. The chilling message of this mass firing, however, is that if a teacher chooses to teach in a poor community where the challenges are greater and the possibilities of failure are as well, he or she is putting their career on the line. This is especially so in a system which measures success almost entirely in terms of test scores. On the other hand, the jobs of those teaching in better schools in better off communities are more secure. And if you think Central Falls will be an isolated case, think again. We may soon have dozens or even hundreds of Central Falls situations around the country due to Obama’s School Improvement Grant scheme. Education reform, as currently promoted by a large section of the political establishment, is in reality a neo-liberal, corporate-backed project. Dominated by corporate foundations and think-tanks, its twin goals are to privatize as much of the public education system as possible and to smash or substantially diminish the power of the teachers unions, the American Federation of Teachers (AFT) and the National Education Association (NEA). According to U.S. Census data, over $800 billion is spent on education, public and private, at all levels, in the U.S. each year. Especially in the current downturn of the capitalist system, corporate interests are determined to pry open public education and get their hands on more of these billions. Examples of companies that already make big money out of public education are the publishers of text books; the companies producing test material; the growing number of for-profit charter school operators; as well as the private professional development and consulting services which have proliferated. This is part of a wider assault on the public sector and on public sector workers which is gathering force here and internationally. The AFT and the NEA are not, by historical standards, particularly militant unions, but their combined membership of four million makes public education one of the best organized employment sectors in the country. They represent an objective obstacle to the ruling class’s agenda at this juncture. And, as a by-product, taking these organizations down would be a massive blow to an already weakened labor movement. The education reformers have promoted several means to achieve their ends. The most prominent is ”high stakes testing,” which, under NCLB, has been used to identify failing schools which are eventually closed. The predictable result is pervasive ”teaching to the test” as schools desperately try to keep their heads above water. Especially in inner city schools this has led to the downgrading of art, music, critical thinking or anything that doesn’t directly help get the numbers up. And even in the core areas focused on by high stakes testing, the results are dismal. The most recent data from the yearly National Assessment of Educational Progress (NAEP), which is a far more reliable measure than the state tests, shows that in 8th grade there have been no gains in reading for the past ten years. In math, the gains were more substantial before NCLB. High stakes testing is connected to another favored reform demand, namely, merit pay. Socialists oppose merit pay because it promotes division among education workers with no tangible benefit to students. Given that it is based solely or mainly on test scores, merit pay means even more teaching to the test. It also means the work of teachers in very different situations is reduced to one highly dubious quantitative measurement. Ultimately, it is a step towards firing teachers whose students did not perform well enough on tests. In 2006, the Bill and Melinda Gates Foundation, major promoters of education reform, funded a study by the New Commission on the Skills of the American Workforce called Tough Choices or Tough Times. This study spelled out the endgame for ”reform” including: replacing public schools with “contract schools,” akin to the much-hyped charter schools; eliminating nearly all the powers of local school boards; eliminating teacher pensions and slashing health benefits; and forcing all 10th graders to take a high school exit examination based on 12th grade skills and ending the education of those who failed. This would mean expelling millions of students at age 16. This is an open admission that providing a rounded education to working class and poor youth in this country is simply not a priority for the ruling class. The U.S. is facing a bleak future of mass structural unemployment where even those with a job will see their wages and working conditions degraded. The situation will, of course, be even worse in black, Latino and immigrant communities. In that context, the goal is to tailor education to the type of workforce that corporate America will need in the future while making education itself a field for profitable enterprise. Of course, big business still wants to identify and separate out the most talented students; but for the rest, the main goal is to instill obedience and “basic skills competence.” High stakes testing and the regimentation it brings fit perfectly with that plan. The promotion of charter schools is currently the sharpest expression of the drive for privatization and union busting. They are increasingly favored as the solution for failing schools: close the bad public school and open a charter in its place. Charter schools are privately run but receive public money and, as already noted, an increasing proportion of them are being run on a for-profit basis. In New York City, hedge-fund managers have ”adopted” charter schools as their latest trendy acquisitions. Charter schools are overwhelmingly non-union and are staffed by young, idealistic teachers who are worked to death and typically burn out within a couple years. Many of the schools are highly regimented and, despite the attention lavished on them, a number of studies have concluded that they have failed to out-perform comparable public schools. A 2003 national study by the Department of Education (under George W. Bush) found that charter schools performed, on average, no better than traditional public schools, Another study by two Stanford economists, financed by the Walton Family and the Eli and Edy Broad foundations (staunch charter supporters), involved an enormous sample, 70 percent of all charter students. It found that an astonishing 83% of charter schools were either no better or actually worse than traditional public schools serving similar populations. Indeed, the authors concluded that bad charter schools outnumber good ones by a ratio of roughly 2 to 1. Nevertheless, Obama and Secretary of Education Arne Duncan are relentlessly pushing states to lift caps on charter schools. Poor cities and poor communities are as ever the guinea pigs. Fully 50% of students in Detroit and Washington, DC, now attend charter schools. In New York City, charters are concentrated in the same poor black and Latino communities where public schools have been closed in large numbers. We sympathize with those working class parents who want to get their children out of inner city schools and understand how a charter school can seem like an oasis in the desert. For many, it feels like the closest their children will ever get to a private education, which is seen as a ticket out of poverty. But the broader reality is that since charter schools select the higher performing students with motivated parents and since they tend to avoid children with special needs or a record of being in trouble, the remaining public schools will become even more of a dumping ground. As the charter schools have the intended effects of weakening unions and opening more of education to for-profit operators, there will be less need for the hyper-rich to throw so much money in their direction and they will wind up being just a mediocre, somewhat preferable alternative to the truly deteriorating public schools. The net effect of charter schools in the long run, therefore, will be to further reduce the quality of K-12 education overall. 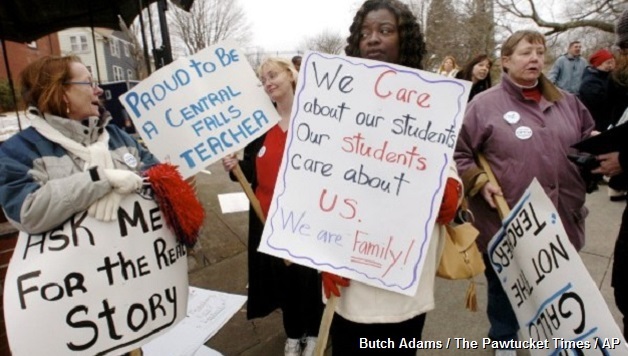 Obama’s stand on the Central Falls firings has thrown down the gauntlet to the teachers’ unions. Even before this it was clear that the president and his Secretary of Education, Arne Duncan, were picking up where George Bush left off in the assault on public education. In fairness, it can’t be said that Obama wasn’t clear about his views during the 2008 election campaign when he came out wholeheartedly for merit pay for teachers and charter schools. that he will seek to extend the competition to a third round next year.” (New York Times 19 Jan 2010). In fact RTTP is clearly the model which Obama is now using for his proposed overhaul of No Child Left Behind. His blueprint claims to remove some of the most onerous aspects of NCLB such as basing evaluation of school performance solely on test scores. In practice, of course, test scores would remain the key ”metric.” The administration argues that its approach would reward the top schools, intervene more forcefully in failing schools (e.g. Central Falls) and leave the bulk of schools in the middle to figure out how to improve themselves with less federal interference. Up until very recently, unfortunately, the leadership of the unions, especially Randi Weingarten, president of the AFT, has not been acting like they’re in a fight. Before the Central Falls mass firing, Weingarten talked continually about working together with the administration as though they could be won over to a nicer, gentler approach. In January, she went so far as to unveil a plan for how to make removing ”bad teachers” easier. At the start of April, the Washington, DC, teachers union leadership signed a tentative deal with notorious union-basher Michelle Rhee. According to Labor Notes, the agreement would provide for a merit pay scheme ”while continuing to whittle away at teacher job security.” The $65 million in pay raises and merit pay bonuses would be paid for by the anti-union Walton (owners of Wal Mart) and Eli Broad foundations. These foundations are key actors in pushing corporate America’s education reform agenda. were so angry in the hours after Mr. Obama first endorsed the firings that an irreconcilable break with the administration seemed possible, perhaps bruising Democrats’ electoral chances in November. Recognizing how a permanent breach could hurt everyone, however, both sides sought to lower tensions, partly by encouraging a negotiated settlement in Central Falls” (16 March 2010). But as the article goes on to say, neither Obama nor Duncan has since backed off on supporting “tough action, including dismissing teachers en masse, to improve learning conditions at failing schools.” The real problem is the unions’ complete dependence on their relationship with the Democratic Party. For a ”few hours” they may have contemplated a partial break but this is so outside their worldview that there was no realistic prospect of them taking this road at this point. Nevertheless, the change in tone from the union leadership is to be welcomed as at least a partial recognition of reality. The Delegate Assembly of the New York City United Federation of Teachers (AFT) passed a resolution on March 24 which condemned Obama and Duncan for their ”complete lack of understanding of education as displayed by their comments and position on the Central Falls firings” and declared that they were prepared to mobilize buses to go to Central Falls and support the teachers there. The problem is that a change of tone is not enough. What is required is a whole new strategy especially as the situation facing public education and the education workforce around the country is deteriorating by the day. Across the U.S., public schools are being closed and replaced by privately run charters; benefits that teachers won over decades are being whittled away; and now huge budget cuts are threatening both to slash tens of thousands of teacher jobs and to hurt kids’ education by raising class sizes. Kansas City is planning to close nearly half of its public schools and cut 700 out of 3,000 jobs. Detroit wants to close 45 out of 172 public schools and eliminate 2,100 jobs. In New York City, Mayor Bloomberg, hero to education reformers everywhere, warns of up to 8,500 jobs being on the line. And everywhere there is a drive from the Chamber of Commerce crowd to use the crisis as a way to push through two-tier pension schemes which would significantly reduce the pension benefits of new hires. The outlines of a new model for teacher unionism can be seen in some of the grassroots campaigns that have developed in several cities against high stakes testing, for lower class size and against school closings and policies which discriminate in favor of charter schools. In Chicago, a Grassroots Education Movement developed, uniting teachers, students and parents, which fought the wave of school closings under then Chicago schools CEO Arne Duncan. They held forums, public protests that mobilized thousands and intervened forcefully at every public hearing. This campaigning had a real effect on public opinion in the city and in 2009 they succeeded in stopping 6 out of 22 proposed new closings. A similar Grassroots Education Movement has also developed in New York City. The New York GEM has vigorously campaigned against the allocation of increasing amounts of public school space to charter schools which frequently squeeze out existing and sometimes very successful public schools. But the biggest mobilizations in the city to date occurred when the city’s Department of Education announced that it was closing 19 schools last December. The local public hearings were packed with crowds up to 900 attending and were often preceded by mass pickets outside threatened schools. GEM’s prominent role forced the union leadership to step up its own involvement. The campaign culminated in a protest by several thousand very angry parents, teachers and students outside and inside the meeting of the Panel for Educational Policy on January 26, which met to decide the fate of the 19 schools. Predictably the PEP, which is a rubber stamp for the Bloomberg administration, voted to close all 19. But in a remarkable twist, two months later to the day, a judge ordered the city to halt the closings because it had not followed the right procedures. The city now has to start the whole process over unless it can find another judge to overrule this decision. In Los Angeles, the announcement of massive layoffs last year led to pickets outside schools, the threat of a strike and even hunger strikes. This fightback had the effect of at least reducing the number of layoffs. Most recently, teachers in Florida successfully fought back against a bill passed by the state legislature that would have abolished tenure and instituted merit pay. The teachers had a great deal of parent and community support. They sent 120,000 messages to Republican Governor Charlie Crist who is facing a strong Tea Party challenge in his US Senate bid. Critically, 25% of Miami teachers staged a sick out on Monday, April 12. On Thursday, April 16, Crist vetoed the bill, a huge victory for Florida teachers which shows that the education reform agenda can be pushed back even in the South, where unions historically have faced huge challenges. In LA, the ability of teachers to resist has been increased by the election of a reform slate to lead the union a couple of years ago. In Chicago, the Caucus of Rank and File Educators (CORE) which played a major role in GEM is mounting a serious challenge in this spring’s union election. 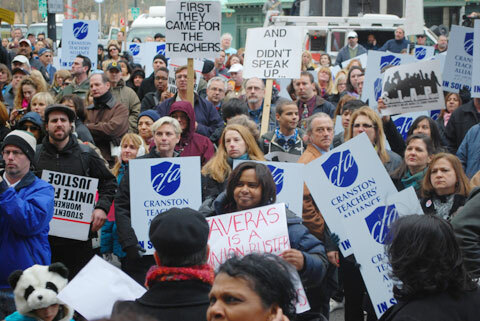 And in New York, GEM backed the opposition slate of Teachers for a Just Contract/Independent Community of Educators. Two members of Socialist Alternative stood on this slate. These developments point to the need to combine the grassroots campaigns of teachers, parents and students against the various attacks on public education to the development of effective oppositions and alternative leaderships in the local teachers unions. Because if the struggle to defend public education is to have any chance of success it requires a serious and sustained mobilization of the union membership working in alliance with the wider working class communities. And this in turn requires the development of a new layer of activists and a new militant leadership. Teacher unions must of course defend their members’ pay, conditions and benefits and do so without apology. But they must also go beyond this to advocate for a different vision of education with a more holistic method of assessment than high stakes testing and the conscious fostering of critical thinking and wider cultural development which are being squeezed out by the current model. They need to fight for real democratic control of schools by the teachers and working class communities they serve. This means opposing the top-down, corporate ”mayoral control” model which has done so much damage in many cities. In Milwaukee, Wisconsin, activists recently succeeded in building public opposition and defeating a proposal for mayoral control of the city’s schools. The teachers unions must also mobilize alongside other public sector unions against the manifold attacks on pay, pensions and services. Despite the attempts of the corporate media to pit working class people against each other by saying, for example, that workers’ pensions are the reason for higher transit fares or cuts in service, we must lay the blame for the crisis squarely where it belongs: on Wall Street and corporate America. We must take inspiration from the unions in Oregon, which successfully campaigned against fierce corporate opposition to pass modest tax increases on the wealthy in a special election in January. This November’s elections for state legislators in most states are a brilliant opportunity for the AFT, NEA and other unions to really punish the local Democrats by standing some independent anti-cuts, tax-the-rich candidates who would stress their refusal to accept any corporate money. How popular would that be! The mass firing of teachers in Central Falls and Obama’s blatant endorsement of it represent a stark challenge to the teachers unions and indeed to public education as a whole. What happens now could have profound effects for the next period. There is no time to lose in galvanizing all points of resistance into an effective fightback. All working class people must see that they have a stake in this fight. Free, high quality education for all from pre-school through college. Tax the rich to fully fund education on an equal per capita basis, regardless of the community, and to dramatically lower teacher-student ratios. Stop all budget cuts and layoffs. We didn’t create this crisis and we shouldn’t pay for it. Stop the focus on high stakes testing. No to merit pay and linking performance evaluation to test scores. Stop privatizing education; a moratorium on further charter schools. For democratic control of schools by teachers, parents and students; no to mayoral control schemes.